Whether you are planning a day trip from Orlando or a longer vacation, Cape Canaveral, is a great weekend destination, home to the Kennedy Space Center, beautiful beaches and an array of things to do. 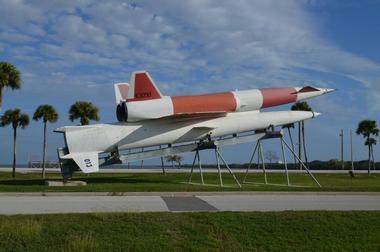 Enjoy the view from Exploration Tower, visit the Air Force Space and Missile Museum and walk through Manatee Sanctuary Park. There are many activities to choose from, including surfing lessons, mini golf, cruises, Segway, dolphin and brewery tours. No trip to Cape Canaveral would be complete without a visit to the famous Kennedy Space Center, which has something for everyone. 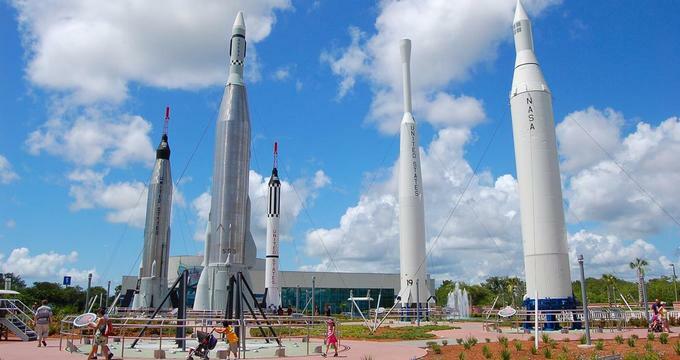 Perhaps the biggest draw is that guests can witness an actual live launch of a space rocket at the center, as well as visit their museum that features everything from astronauts’ suits to pieces of real moon rock. You can also see the impressive Atlantis shuttle, as well as many other rockets and memorabilia charting the history of space exploration from the past to the present. Make sure to have a look at their space shop to find a fitting souvenir before you leave. If you want to spend the day exploring over thirty-five acres of lush parklands then look no further than Jetty Park. There is a stunning beach that sprawls over four acres and has all the necessary amenities for enjoying some fun in the sun such as deck chairs and beach umbrellas. If you would prefer to spend the day fishing then there is a dedicated pier that stretches into the sea, allowing for an unrivalled angling experience. There is also a playground for little ones to enjoy and even pavilions for rent that are ideal for larger gatherings or group picnics amidst the beautiful landscape of Jetty Park. The first lighthouse was erected some 150 years ago to warn mariners of the dangerous areas along the shore. Unfortunately, the first lighthouse, which was only 60 feet tall, was not tall enough. The next one was too close to the shore and had to be moved, which was not an easy task in terrain full of swamps and lowlands. Finally, after ten months of rebuilding, the new lighthouse was relit in 1894 in the location where it stands today. The new tower is made of iron plates that are bolted together and covered with two layers of brick. The entire lighthouse is 151 feet tall, and it sends a beam of light 22 nautical miles towards the sea. While the lighthouse is a great tourist attraction, and visitors can climb to the fifth level of the tower. Its main role of guiding sailors remains its most important job. The Lighthouse is open for tours on Friday and Saturday; reservations are required through Sunward Tours Inc: 321-453-0704. 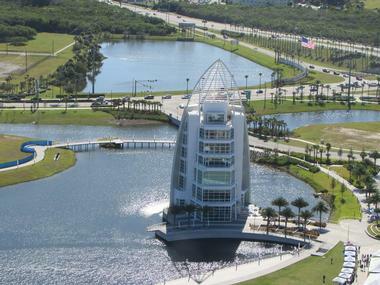 A proud landmark in Cape Canaveral, Exploration Tower invites visitors to learn all about the history, culture, and flora and fauna of the region. Spread over seven floors, the tower has several observation decks for visitors to take in the spectacular views over Cape Canaveral, as well as exhibits that focus on giving you a hands-on experience through interactive play. There are film areas and photographic galleries, and you can even pilot a virtual boat or witness a space rocket launch from the nearby Kennedy Space Center. If you are feeling hungry after a day touring the tower there is a cafe onsite as well as a gift shop. If you want to learn all about the history of rocket and space flight then you need look no further than the Air Force Space and Missile Museum. Opened in the 1960s, the museum is packed full of exhibits dating from the early days of space flight until the present, some of which include rockets, satellites, missiles, and historic displays that chart key moments in the history of space exploration such as famous female astronauts and previous unmanned missions. The museum is not just an indoor venue, and there is even a rocket garden for visitors to wander through and witness retired rockets, launch pads, and control towers. Located on the quaintly named Banana River, Manatee Sanctuary Park spans over ten acres and boasts a whole host of activities that visitors of all ages are sure to enjoy. There are paved trails and exercise activities available for those looking to keep fit, or if you want to go for a stroll then you can explore the covered boardwalk. Those who want to bring along some refreshments can use the picnic and grill facilities at the park. There are even manatee (also known as a sea cow) sightings so scan the waters and you may be lucky enough to see one of these majestic creatures in their natural habitat. Victory Casino Cruises brings you more than a casino – it is a casino located on a cruise ship that departs twice a day for trips around the Cape Canaveral area. Guests can choose from a late morning or evening cruise, and there are trips available seven days a week to fit with your schedule. Aside from the casino located in the ship, there are meals provided at Atlantic Dining that include succulent freshly caught seafood, and if you catch an evening cruise you can dance the night away at Big Norm’s Club V with an in-house DJ and dancers. Day cruisers also won’t miss out, as drinks in the sun are available at Dolphin Bar. If you want to explore Cape Canaveral from a completely different perspective then head to Space Coast Segway Tours, hop on a Segway transporter, and zoom around at your leisure. The tours cruise by Blue Point Marina to offer you unparalleled views across the waters and allow you the chance to try and spot local aquatic life such as turtles and dolphins. The tours are open to beginners, and knowledgeable staff will teach you how to safely operate your Segway before you start. Each tour has a designated guide who will point out spots of interest along the way as you breathe in the fresh air and enjoy the sunshine of Cape Canaveral. 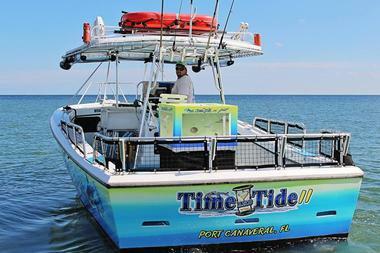 For something a little different book a trip and go deep-sea fishing in Cape Canaveral. The Orlando Princess and the Canaveral Princess will take you out on the water and the friendly staff will give you all the best tips and tricks so that you will have the best chance of catching some fish. Meals are provided along with unlimited drinks, and you don’t need to bring any fishing tackle, as everything you need is available on board. There are a variety of trips to choose from including full or half day trips and even night trips to catch sharks, which are known to be more active after the sun goes down. Get up close to Mother Nature and experience the aquatic life of Cape Canaveral firsthand with Time and Tide Tours, who take you around the Atlantic Ocean and the Banana River Lagoon in search of dolphins, stingrays, turtles, and, when conditions are right, even whales. The Time and Tide Tours boat even has its own aquarium on board that allows you to see even more of the sea than you ever imagined. The tour group focuses on imparting a love of the sea as well as taking guests through the ecological history of the waters teeming with vibrant life around Port Canaveral. Limo Cycle Tours is a collection of party cycles that allow visitors to cycle or cruise throughout the Port Canaveral area and take in the sights while also getting some exercise. The route is dependent on the tour chosen. Some tours begin at Exploration Tower where tickets are free for members of Limo Cycle Tours and wind along the entertainment district and past the waterfront and the picturesque Jetty Park. A tour guide is provided to fill you in on the history and culture of the area, and you can enjoy the outside atmosphere of Port Canaveral all from the comfort of your cycle. If you do not mind getting wet and have a great instructor, surfing is not as hard as it looks. Just ask Sandy Beach who has been sharing his passion for surfing for 24 years and is now running the only surfing school in Cape Canaveral. He will spend about ten minutes with you on land to show you the basics and then get you in the water. The rest is a matter of trying, enjoying yourself, and trying again. Sandy will teach you to respect the sea, understand the anatomy of the board, paddle, and pop up and stay up. He’ll also teach you some handy surf lingo. There is nothing to worry about, as Sandy is also certified in first aid, CPR and has lifeguard experience. Sandy provides all the equipment –surfboard, rushguard, and wetsuit. There is no age limit, so if you want to try it, come see Sandy. Real golf tends to be very serious business. Mini golf, on the other hand, is just pure fun, regardless of your age. And mini golf with gators, turtles, and other critters is an adventure you should not miss. 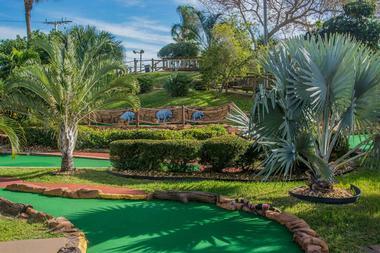 Golf N Gator has two 18-hole courses – Gator Mountain and Swamp Cave. Choose one or play both. Lush tropical landscaping crossed with streams and broken by waterfalls and two giant dark ponds where turtles, alligators, and fish lurk surround the courses. Enjoy the jungle and play to win, and when you finish, go play with small young alligators and feed the bigger ones. Golf N Gator has 30 American Alligators of all sizes and ages. You can also play with a tortoise, snakes, spiders, and birds, and even hold them if you dare. Craft beef aficionados love going to the breweries to see the technology and the shiny machines and to talk with scientists turning hops and other grains into our favorite beverages. Then there are those who love going to the brewery tours in part to see the process and in part to get free samples. Visit Florida Beer Company’s taproom to sample the latest brews, listen to some live music, and talk about beer. 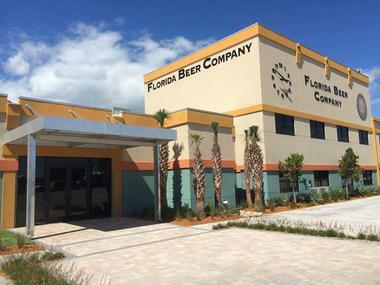 Taking in the 60,000 square foot facility of this largest craft beer company in Florida is truly fascinating, and taking a tour will allow you to try four samples of their latest products. But visiting their taproom is much more fun. You can try all their award-winning beers on tap, and there is something for every taste. There is live music, trivia nights and other activities, and of course many people around who want to talk about beer.